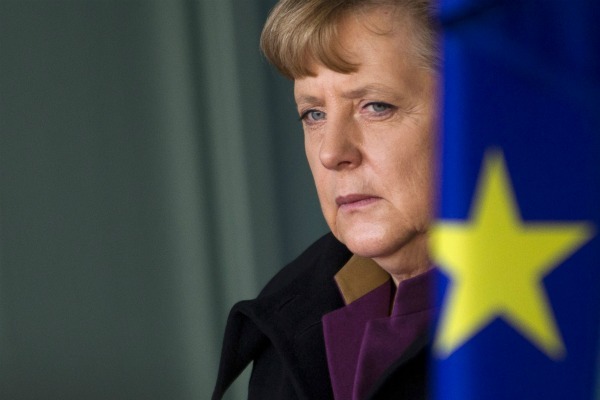 In a television interview, German Chancellor Angela Merkel said the euro zone was moving inevitably towards a "political union" requiring nations to cede more sovereignty, and that would lead to more of a multi-speed Europe, with non-euro states in the slow lane. “We need more Europe, we need not only a monetary union, but we also need a so-called fiscal union, in other words more joint budget policy,” Merkel told ARD on Thursday (7 June). “And we need most of all a political union – that means we need to gradually give competencies to Europe and give Europe control,” she added. European Council President Herman Van Rompuy, who chairs EU summits, said he would only present "building blocks" on closer euro zone fiscal and banking union at a meeting of EU heads of state on 28 June. But the German Chancellor doused expectations that the June summit will produce a breakthrough, saying progress towards a fiscal and banking union would take substantially longer. "I don't believe that there will be one single summit that will decide on a big bang," Merkel told ARD. "But what we have been doing for some time, and on which a working plan will certainly be presented in June, is to say we need more Europe," she said, adding: "Whoever is in a currency union will have to move closer together." The German Chancellor also admitted that this would require different paces of integration as some EU countries like Britain will refuse to participate. "We have to be open to make it possible for everyone to participate. But we cannot stand still because some do not want to go with us," Merkel said. Most EU officials see the process of integration taking five to 10 years at best, much longer than the view of the markets, although economists also argue that agreeing steps towards closer union will itself help boost market sentiment. Speaking to think tanks in Brussels, Van Rompuy said the euro zone was fighting for survival. "The rest of the world is looking at us. They are not asking for new debates, they are asking for decisions," he said. According to Van Rompuy, the aim is to have detailed proposals in October. European Commission President José Manuel Barroso has said he will propose a roadmap and "calendar" for more European integration at the June summit, without discarding the possibility of a treaty change aimed at injecting more federalism into the Union. As the EU's biggest economy and largest contributor, Germany holds the key to greater integration within the bloc, together with its long-time partner France. But Paris appears hesitant to take the federalist leap that Germany is asking for, pushing instead for more immediate steps to boost economic growth at European level and pooling euro zone debt by issuing jointly backed eurobonds. During his first visit to Brussels on 29 May, Bernard Cazeneuve, France's new Europe minister, refused to give specific conditions under which France could agree to additional sovereignty transfers to Brussels. "If in this perspective [of eurobonds] the discussion focuses on greater modes of integration, these topics will be addressed in due time," Cazeneuve said in response to a question from EURACTIV. "We will not indicate now what the steps are when those steps are part of the negotiation. All this must be made by doing." Merkel's push for greater EU integration also underscored a growing rift with non-euro member Britain, which said bluntly on Thursday that it would not take any part in a euro zone banking union as envisaged by the European Central Bank and the European Commission. Finance minister George Osborne told BBC radio: "There is no way that Britain is going to be part of any euro zone banking union. "I think Britain will require certain safeguards if there is a full-blown banking union." His comments, reiterated more softly by Cameron in Berlin, highlight the potential complexity of EU negotiations on the issue, since London is the euro zone's main financial centre and could veto deeper banking integration. German Chancellor Angela Merkel revealed her long-term vision for Europe in an interview with six major European newspapers in January. In the interview, she said the debt crisis was forcing eurozone countries towards a federalist model. The chancellor's European vision was made public ahead of a January summit where EU leaders finalised a new treaty aimed at tightening fiscal discipline and deepening economic integration in the eurozone. Without mentioning federalism, Merkel described a new architecture for Europe where EU institutions have the last word over member states, placing her on a collision course with British Prime Minister David Cameron, who has vetoed attempts to transfer more powers to Brussels. 28-29 June: Formal EU summit in Brussels to finalise growth agenda. I do not believe there will ever be EU political union! The monetary , economic situation is not conducive to countries ceding sovereignty to Brussels . What is the point in filling a basket with rotten apples on top of the good one . How will political union be achieved , by EUSSR decree , or would there be EU wide referenda ? Even at the present , I cannot see the people voting for political union . Barosso is creating yet another road map , but that does not mean anyone will go anywhere . The Euro is in a downward death spiral , from which there is no realistic prospect of it ever recovering . Hear, hear! Flush the EU down the toilet and start afresh with sane people in control of their own countries. Sovereignty. That does not prevent cooperation between states, and trade etc. Either the EU is competent and they are deliberately trying to cause meltdown (conspiracy), or they are completely incompetent. I prefer to think the latter, but you have to ask yourself, how incompetent can people really be? Probably the answer is very incompetent. Allegedly, one of the people named above is a Jesuit. What is the history of Jesuits and revolution? It is my opinion that incompetence on the part of past and present MPs and senior bureaucrats is the cause of the pesent EU/Euro crisis . Making ” Roadmaps ” that conveniently bypass problems and reality . I think it fanciful in this age to believe that Jesuits have been plotting to take over all of Europe ; when Europe is being overun with Moslims , they would not be seen as having much success . What is worrying is , that there don’t seem to be any politicians who are men of wisdom , or others waiting in the wings to follow them . The Eu seems to be governed by Lemmings hell bent on diving to their death over a precipice . You are right “Flush the EU down the toilet”, but where are you going to find any sane people to take control of their sovereign countries ? Nigel Farage ? At least he calls a spade a spade in the EP . I love seeing Rumpy Pumpy and Barosso cringe at the dreadul truths he expounds . This is an age of career politicians , who have studied political science ; but have never held a proper job in Industry or had any prior experience of the basic needs of ordinary people . Entrepreneurs , Captains of Industry , big Farmers and Landowners should be in parliament ; men and women who know how to successfully make money , manage employees . The problem is that Merkel and other European leaders are running scarred about the fallout if Greece, Spain, Portugal, Italy et al fail through a domino effect. Currently it is estimated in some circles that total sovereign debt in the eurozone is anything from $4 trillion upwards. As for example Spain who has a debt with Germany of around €110 billion and total debt with other European nations including Germany of over €300 billion, the €100 billion will only forestall the debt crisis there. We have to remember also that Greece has had around €280 billion to date and that has not so far stemmed the crisis there. So expect far greater numbers to be used as bailouts in the future but where I doubt that the EU has sufficient sums ultimately at its disposal to stop any future meltdown. Certainly the €1 trillion will not be enough to save the EURO. We are therefore living in times of plugging the hole temporary until the dam eventually bursts as it ultimately will. But by then the indebtedness of Europeans will be enormous and where this futile attempt to save the EURO will have simply gone down the drain. Unfortunately, you, me and uncle tom cobley and all within the eurozone will still owe trillions. Thereafter this EU banking/sovereign debt crisis will take decades to solve if we try to save the system and on the way there will be austerity not seen the like of since post WW2. Do you think that these bankers who have no empathy with society will care. I very much doubt it with their futures previously secured through tens of billions in pre-and post meltdown bonus payments. Over all the politicians, who apparently are in the pockets of the banks who caused all this, are only as usual telling us what they wish to tell us and no more. No wonder that the European electorate do not trust politicians anymore, even less than when they did not trust them before I would say. Too much debt for the problems to go away. Overall we may be at the start of a knock-on effect leading to an impending global depression over the next five years and which will have had no precedence for the West. Even greater than the 1930s this time around I consider with the sums involved and where it is not just the USA, but the whole of the ‘western’ world that is engulfed this time around. Note I do not say the ‘East’. Like youself, I think the most likely explanation for this mess is down to incompetents who are career politicians who have either not had a real job outside politics, and therefore who don’t understand how things work in reality, or who have had non-politics-related jobs but so long ago they have forgotten much useful stuff. I would also say the polarised groupthink and consensus building/thinking may explain a lot of the problems we see. If something is wrong from the outset, it matters not how many people believe it to be true, which is why consensus thinking only works if the underlying belief happens to be true or correct. If one looks at history, one can certainly find evidence to show that different powerful groups have certainly attempted to attack each other, and one of the most effective ways seems to have been that of using deception to infiltrate the enemy camp (like a trojan horse). There are many instances where this has happened and I don’t wish to be drawn on specifics, but examples can be found by searching. Blair kept his religious dimension pretty low-key whilst in office, at least as far as I remember, but now he has the Tony Blair Faith Foundation. His actions in Iraq and Afghanistan have been quite horrific, causing a large anti-war movement to protest in many places around the world, and he lost a lot of support from his own supporters for these reasons. As left-leaning governments seem to be more relaxed about immigration than their right-leaning counterparts, perhaps this helps explain the immigration aspect you refer to? This viewpoint is from my own observations, but feel free to correct me if you think otherwise. The wisdom point you make is certainly interesting too. Perhaps wisdom is a much-needed quality that is sadly in scant supply? If we look at the DIKW model (Data, Information, Knowledge, Wisdom), then it can be seen that Wisdom is the highest level in this model, and so perhaps is harder to attain? People more familiar with this might expound upon this further. So perhaps there should be a wisdom exam for aspiring EU actors? It might cause a skew in the hiring of personnel though, as wisdom tends to come with age, although not exclusively, so this would likely limit openings for younger entrants perhaps? This wisdom aspect could perhaps help explain some of the other points you make. I agree that Farage’s video diatribes make hilarious viewing, even if unpolitically-correct. I think many of the MEPs in the chamber secretly find these funny too, but try to hide their smirks. It all helps to balance things out and highlight ‘the elephant in the room’ that nobody wants to talk about for fear of looking stupid or being against the perceived consensus. Hats off to Farage’s bravery and courage for that, even if others disagree with his methods. Regarding your point about suitable politicians for a new type of leadership, I agree that career politicians may not be the best people for the job, as they will likely use political methods to gain support rather than the value of their message. However, allowing people from industry and wealthy landowners to take their place is likely also fraught with potential dangers. Financially-motivated people might not be the best people to drive policy formation, as the scope for self-interest and corruption would be high, and I believe this is already a problem in our current political structures. However, perhaps their input would certainly be of immense value, if it could be shown that corruption could be avoided. Perhaps, therein lies the problem? Very interesting comment David (Hill), and I certainly agree with a great deal of what you say. Regarding your statement that this is primarily a Western problem, it begs the question of why the Eastern world has not suffered such a fate. Although Eastern economies are now experiencing reduced demand for their manufactured products & services, due to our financial situation, I think it is fair to say that this is a knock-on effect due to our problems of being virtually bankrupt. Would you say that the current practice of Western banks not separating consumer retail banking from their riskier & speculative investment banking arms has been the primary driver of this banking crisis? Or that the availability of cheap credit has been another exacerbating influence? Perhaps both? Personally, it would seem prudent to separate retail & investment banking arms, but so far this has not happened, as far as I am aware. With retail & investment banking under one roof, we have the situation that governments will likely always bail-out these banks in times of trouble, in order to protect individuals’ savings. This unsatisfactory arrangement leads to risky gambles by investment banks, as they know they will always be bailed-out. So, in your eyes, what do you see as the best way forward? It is difficult to define who should become MPs , but I think the tendency today for career politicians is wrong . I agree there should be a broader spectrum than those I mentioned , like leading trade unionists . Being a politician isn’t a science , whereby you go through the motions , complete the formula and hey presto you have the correct result . I recall boys at school who were very clever and passed all their exams , could read a book in a day , but hadn’t a grain of practical common sense . Parliaments need thinking men , with original thought , practical ability and plain common sense . You criticise my suggestion of industrialists , who might have a vested interest . A vested interest is an inducement to run a country well . The overall running of a country is important to the whole community , business will not thrive without good exports and people will not have jobs and good wages . Industrialists employ a lot of people and must have an understanding of them and care for their welfare in the interests of creating a thriving business . My family have been big landowners for many generations , 5,500 acres , 20 farms , umpteen cottages , responsibilty and care for all tennants and estate workers . Landowners in such a position are close to their people and have an understanding of the needs and welfare of the poor . In two generations there were MPs . With post war socialism we were despised as charity , where as government social services was not seen as such . Of course the people paid for it themselves , in preference to being given . George Brown went to the house of Lords after Harold Wilson was chosen as labour leader . Interestingly George Brown was a very open minded free thinking Lord , as often are trade unionists . Open mindedness and free thinking are essential qualities of an MP , something which is sadly lacking today . High intelligence does not equate to creative thinking. Newton was a poor scholar at Cambridge and lost his groats (his exam deposit) for gaining the lowest BA degree possible. Indeed his contemporaries said nothing would ever come of Newton. A similar thing can be said to a certain extent about Einstein who initially failed his polytechnic entrance exams (had to sit them again). Therefore the government and Whitehall think that if they get the highest level graduates that they are onto a winner. They are not I can tell them as the history of this country’s downward spiral has shown over the last 50 years. Indeed unfortunately with this ‘elitist’ mentality we are more-or-less guaranteed failure in the years ahead. What we need is creative people with the innovative intellect to drive our future economy. More of the same will just drive us more into the ground and eastern subservience lies at that level I can tell everyone. There are vast of examples of where government and universities et al get this ‘elitism’ phenomenon so very wrong. Three months before his passing I was in communications with the late Jack Kilby, the inventor of the initial ‘chip’ (his patent has precedence over that of the founders of INTEL). According to Texas Instruments website this single invention is the fundamental base of a global industry that did not exist 40 years and which now turns over around $1.85 trillion annually (more than the total output of Russia. Jack could not get into MIT as his entry qualifications were not high enough, so he had to settle for a second division university. But within ten years of leaving his university he invented the ‘Chip’. These are the people that we need advising government, people who in a single swoop can create a product that revolutionises the world. One other point is that if you undertake research and look at the results of all our R&D government investment (over £5 billion a year on average for the past 25 years in real terms), you will find that from this vast influx of funds no billion dollar industry has ever emerged. i.e. there has been little or no pay-back. Therefore if this ‘elitism’ thinking is so good why have we not created the equivalents of companies such as Apple, Google or Microsoft. The answer is that ‘elitism’ does not work and that is why my institution has been telling government (the old DTI for two years included between 97/98 and even before and post 98) that what we as a country has to develop is a network of creative incubators for our independent thinkers (according to Japanese and German research the best by far and where our fundamental thinking has created up to 54% of the modern technological world), not our universities or our corporate advanced centres of so-called innovation excellence. Then we would get people of the ilk of Jack Kilby emerging, as the ‘chip’ was Jack’s personal hobby and created the prototype in his own time with no help from his employer Texas Instruments (like many inventors do and without any financial assistance). If government took on board this out-of-the-box thinking we would then see something happen in a big way. Indeed you simply have to have the fundamental thinking first and where the history of S&T has shown us that this initially in the majority of cases does not emanate from our universities or advanced corporate laboratories. Indeed it should be  Fundamental independent thinking first  R&D at our world leading universities  Exploitation by our UK businesses. At the moment and for the past fifty years or so we have not had element  in the equation and that is why we have been continuously failing and going down the preverbal drain. It is about time therefore that government, Whitehall and UK Plc understood that they need these creative incubators first or they will certainly be bankrupt in the not too distant future. Once we have reached such a low point in the economic stakes it will be more-or-less impossible to drag ourselves out again. We simply have to start using our common sense and fight back using the world’s greatest wealth creator, innovative thinking. ps. If we had a pan-EU interlinked network of these creative incubators I have no doubt that we would lead the world in 25 years time, but where with the present constantly brainwashed mindset of our EU politicians and mandarins, we will most probably end up on queer street come 2037. Things are not looking good at all for us long-term I can tell you with our stupid mentality and elitist mindsets. I respectfully in part refer you to my reply to David Barneby. Too many MPs and politicians have NOT a technical background and therefore do not understand that the greatest wealth creator throughout history is technology. This is why we had the silly idea that service industries were our salvation (banking, insurance, etc, etc). Most now see that this is the thinking of the mad and is totally flawed. They forgot the fundamentals of business and you have to create something physical, not just bits of paper. Therefore political parties to get their nations moving positively forward have to forget about constantly electing just good speakers (mainly lawyers and where at the last count the UK parliament was filled with nearly 55% of them – in the USA it is over 90%) and get technologically based politicians running the country/economy. For the creation of advanced technology is the only way of addressing the China problem and our economic fortunes. With regard to our banks, they should be demoted to support industries as they were years ago. They have lost the plot over the years due to them being run by bankers who had no empathy with society and only concerned with the wealth of themselves – sheer greed in other words and having no concern whatsoever for the people who made them the money in the first place. We have to get our priorities right and place innovation and invention (Britain’s and the EU’s greatest strength if it was allowed to flourish) first and the banks and all other entities like our banking industry second. Only by having an intelligent way of moving forward will we achieve this and a future for those being born now. The future is bleak under the present thinking and political regime. I agree 101% with your comments. I have always believed that inventors and innovators were a great strength of the UK, and the British have long been admired for their creative flair. What I have noticed though, that unlike the USA, we seem to develop great ideas and then we fail to develop and market the ideas, and invariably they end up being bought and sold by the Americans. What I would like to know is, and perhaps you know this, is what is it about the USA, and Silicon Valley in California in particular, that gives them a fertile environment? I presume it’s shrewd investors who are able to see potential in ideas put forward to them, and who then provide development capital to develop and market the ideas? The Americans are well-known for their marketing and business nous. If so, in your opinion, why is this element sadly lacking in the UK, and also the EU too? Going back to my earlier comment regarding why the ‘East’ has not been engulfed like the ‘West’ has with this banking crisis etc, would you care to give your thoughts? Presumably debt was much better controlled? If only he were still alive today… a breath of fresh air. Also, do you have any thoughts about splitting retail banking from investment banking, as I mentioned above? I agree with the need for thinking people in Parliaments, as with other places too. However, in our politically correct society, I think people have lost their colourful/creative sides and have perhaps been conditioned into becoming consensus people/group-thinkers, and like David Hill mentioned, innovations come from original thought and people who think outside the box. I’ve seen innovators in the UK approach banks for funding, and the grey-suited branch manager can’t see any potential in the business plan, so denies funding. And if the innovator does get funding and the business unfortunately goes belly-up, the personal consequences of bankruptcy can be severe. And due to the British attitude towards failure, it’s easy to see why few take the risky path of entrepreneurship. In America, people would treat a business failure with almost no stigma, and would instead respect the person for having at least tried. So there is an attitude difference to failure, and perhaps this is another reason why UK/EU doesn’t innovate as much as it could? Addressing your point about vested interest motivating business people to manage political situations well, I understand completely that money is a motivator, but my point really was that we need to safeguard the culture where business people lobby governments to pass legislation that favours them and then they provide kick-backs to the politicians in return for the favour, or party donations for elections. Perhaps you disagree? Well here we go again. Merkel running the only functioning european country left. I think if she lived in the netherlands shed be singing another tune. Sept 17 is judgement day in the netherlands and it looks like Geert Wilders is going for a landslide. 87% of the people are for wilders. These numbers are from independant polls and not goverment polls . Holland has been plundered by the eu, our housing market is in shambels we have foodbanks where people lineup for food for thier kids, we have politicians making deals behind closed doors because theve been told to do so, and to make matters worse next year we wont make 3% again. More misery yahoo. Long live the elite plan. Wilders wants out and the majority of dutch are with him thank god. The EU love propaganda and dirty politics and i wouldnt believe a word they say…! * Does Europe Need a “European New Deal”? * What is the Fate of the Euro? * What European Perspective Will the EU Give to its Neighbourhood (Balkan, Turkey and the Mediterranean Region, Eastern Partnership)? Very interesting news about Gert Wilders and the hope that The Netherlands might leave the EU . You are right the EU spends a horrendously large amount on prpaganda . I guess this site is their’s to keep people interested informed about the EU . Nearly all the people who comment are harsh EU critics . The Dutch could do us all a service by leading the way out . As n EU policy expert , you seem rather shot on answers. “Does Europe Need a ” European New Deal “? NO ! ” What is the fate of The Euro “? Collapse or better still withdrawn ! I do not believe that Turkey should ever join the EU ! Though a small part of Turkey could be said to be a part of Europe , the major part is not . Turkey’s joining the EU would likely cause social unrest among ethnic Europeans , as most people understand . There are already an excess of Moslims at large in the EU , Turkey would open a flood gate . Turkey joining the EU could cause the exit of a number of key countries and the eventual break up of the EU . I should point out to you that Europe is not the EU , nor the EU Europe . thank you very much for your valuable opinion and for your answer-options as regards my questions. Although from an analytical points of view, questions are more important than answers, I make some comments to your “shots” to present a more detailed way of my conception. Well, it is up to the democracies to decide what kind of governments(socialists or not) will they send to power. Unfortunately, the magnitude of the crisis has been never seen before so there is some kind of need for an effective crisis management and economic growth. And people want to believe in something new that’s clear. Some say that the new Deal wasn’t the real answer for the big economic crisis 1929-33 (since it couldn’t prevent the II World War) but the welfare state. The welfare state can help those who are in need and an effective welfare state might be another possible way to resolve the current problems. 2. Euro – As I said earlier, the Euro is one of the most important achievments of the EU, which is more than a symbole. Every European politican has to make every effort to save it. I do not share the ‘once in use-throw away’ approach of our modern consumer society. If something doesn’t work properly we have to repair it instead of throwing it away. 3. Turkey. There is a place for Turkey in the EU in a medium/long term. Turkish minorities are already present in 2 EU Member states (Bulgaria, Cyprus). A potential EU membership will force Turkey to draw near its system to Europe’s (the recognition of the stateless kurd minority ex.). On the other hand, Turkey can renforce the EU’s declining economy and its military capacity. With a turkish membership, the EU’s international pound will grow accordingly. And since Kemal Atatürk, Turkey is on the way to belong to the European family (not to forget: there were dictatorships in a large amount of EU members ex. in Portugal and Spain). What I have seen and comprehended around the world over the last 40 years and especially in the East, is that they are more inclined to consider anything. They just look for and possibly live for, the next business opportunity. Here in the EU we are fixated with systems, protocol and darn right rigidity. Although corruption is ripe in all countries this is just one aspect of the east and they look at the full spectrum of ways in which to make themselves incredibly rich. It is this rigidity that the EU has to cast off as this destroys free-thinking, something that never happens in the east. It is like having an open mind and being totally innovative at the same time. Something the EU threw away years ago when it became a political project – they put economics on the back burner. We in the EU have over the decades become unmoveable and set in our ways. The reason for this can be brought to the door of the same old political parties and same old political thinking. Nothing really changes and it will not do until the EU starts thinking in different ways and creating new economic and progressive systems. Someone somewhere has to emerge to kick-start a new revolution in leading the EU to successful waters. That is if the EU is to exist at all. We talk all the time of investment in our futures and spend hundreds of billions a year in the EU on R&D but if one examines over the past 25 years what these vast sums have derived us, you will find very little in economic payback. Why are we spending all this money when it is a road to nowhere. Consequently there is something gravely wrong in the way that we spend our had earned cash in the EU and the fault again lies at the feet of our political masters who have not a clue how to organise a pi.. u. in a bre.ery. First we have to stop squandering all these 10s and 100s of billions and start spending far more wisely. Firstly we have to have a sifting system where the best ideas are backed by governments, for half the R&D funds every year go to ‘pet’ subjects that leads again to literally nowhere. I would say at least 90% of this funding goes down the drain. I mention this as to build a successful economy takes at least three decades to do even after you have determined what may probably be the global industries of the future. But we have to start such a sifting system for our own good. That can only come by being creative ! We have to start at the fundamental base again, as presently we are going backwards and I cannot see with the present politico-economic thinking, no light at the end of the tunnel for decades to come. Just more decline and erosion of our living standards. Change has to be at the forefront of our thinking, not the old thinking that we presently preserve for some very strange reason. Possibly to do with the minority in power being I am alright jacks and are not in the least affected by the turmoil as they are looked after from cradle to grave no matter how bad things get. And it will get bad with our present thinking, that is something that we can all be assured of – except those of course who are running the show and basically do not give a damn with their secured EU life. (1) Norway has huge oil revenues to support itself. (2) Sweden has huge taxes: state provides stuff, so little to pay for, but at a price! No, thanks! The euro can’t survive on its own, so we are now told, so it is a trojan horse into later adoption of fiscal & political union. So the euro is a kind of incremental inching forward attempt towards complete union… and this is not how it was advertised when the Common Market was pitched way back. I have no problem with Turkey joining. It seems there is a lot of xenophobia/masked racism around. If it makes sense for counties as diverse as protestant strong-work ethic northern european countries to co-exist in EU alongside the now-troubled southern european countries, then why not Turkey too? I read with interest your further comments , regarding mine . I have looked at your website , to see where you’re coming from in your thinking . I see that you are a young man full of idealism , hence the questions but as yet no answers . In practical terms , why not have an EU ? Why not have a single currency ? When there is no answer to the question , there is no need for thought and reasoning as to why or why not . The original concept of an EU was for 6 countries , France , Germany , Italy , Netherlands , Belgium and Luxemburg to join together . They had all been overun and defeated in WWII . The idea being to prevent war between them ever happening again . Though economics is often the reason why one country wants to take over another ; the Treaty of Rome was not about economics . The enlargement of the EU , initially pushed by Britain , has put the EEC/EU completely off track . The French and original members did not want any deviation from their original plan . Britain suggested enlargement to a loosely knit Confederation or Commonwealth . Brussels took the enlargement and continued on course for a single federal state . That was a terrible and irreparable mistake , as we find today . The Euro was known to all concerned to be deeply flawed , but Brussels continued regardless . Socialism succeeds until other peoples money runs out . You cannot have a wealfare state that is beyond the means of a country to pay for it . The idea of an EU , wherein taxing the wealthy states to pay for the poore unproductive states cannot work . People in Germany , Netherlands , Finland , Sweden , are not going to work their Butts off to have their living standards levelled down to pay for the nare do wells . I appreciate that nothing is achieved by negative thinking , but answers to questions would highlight the pitfalls before you fall into them . This is a typical example of Brussels thinking . The EU does not extend beyond Brussels and the National MPs who visit there ! We the people who are misrepresented by our national politicians , have to suffer their political ambitions , greed and incompetence in furthering their own ambitions and dreams . The EU/Euro is not something reparable that you cound mend . Though politicians and bureaucrats at Brussels won’t admit , it has blown itself apart . As is being seen in demonstrations and riots all over Europe , people are fed up with the EU and FrancoGerman dictat . The only thing to do with the EU/Euro is to get rid of it altogether , a return to national sovereign states and their original currencies . Norway has huge oil reserves and a small population . Norway isn’t a member of the EU , because their people don’t want it . Quite Right People !!! The Euro cannot survive ! The EU will not become a federal state . You may not have any problem with Turkey joining the EU . You may see it as Zenophobia/Racisms . We have no antipathy to Turks in Turkey or as occasional visitors . Oil and Water doesn’t mix , so why try to mix it . One of the biggest mistakes the EU has made is thinking that northern European countries can coexist with southern European states . To add Turkey to an equation that already doesn’t work is adding fuel to the fire that is currently consuming the EU . In the EU , reasoning produces wrong answers , so ask questions but don’t answer them ! I agree with your realistic words. Unfortunately those who govern us in the EU are not realistic and stick their heads in the sand as they always think that everything will come right in the end. It never does I can tell them and all that this EURO keeping will do is to put us Europeans (incl. the UK as we always eventually get dragged into bailing out the EU also), is that we accumulate even more huge debt that takes more time in the future for EU citizens to pay off. I wish that there more realistic thinking people like yourself around and common sense for a change stepped in so that all this political charade can be seen for what it really is – a road to utter ruin. Indeed although we know whatever way we move now with the EURO/EU there is going to be great harm and social sacrifices in the years ahead. Probably the coming of a second great depression. But of the two outcomes to both get rid of the EURO and dismantle the EU, the sooner the better is by far the lesser of the two evils as history will recall if our political masters get their way and preserve everything as they seemingly wish to do. There are no two ways about the problem, we just have to start afresh or this turmoil will go on for more decades that people really appreciate presently and where this will add further huge debt on top for the 99% of the people within the EU (around 700 million). Madness apparently always prevails in politics and where the preservation of the EU/EURO will eventually be seen as the greatest blunder in the history of world politics. Unfortunately again, only the people will suffer, not our political masters and EU mandarins who decide our future dire fate. I also agree with the comments concerning Turkey – just do not go there as increased eastern membership with further crystallise a steadily solidifying swollen joint ! Using an aphorism from the medical world, we will get unconditional painful gout indefinitely. But it will show again if Turkey enters the fray, that these Euro technocrats are to all intents and purposes simply off their rocker. David Barneby, you mentioned that the EU is put policy before economy and that is the source of problems. (Remark: Yes, we celebrate on 9 May the treaty of Paris and the french-german peace process but the economic benefits motivated the creation of the European (later ECONOMIC) Commuities). The ECONOMIC benfefits motivated the UK to apply for the EU membership. Since UK lost its colonies and its economy was declining it was a logical step to catch the EC train. For those who suggest may I point at the EFTA (originally created by the UK). With some exceptions, the EFTA states became EU member-states and a large part of the EU law (EEC) is applicable to EFTA states, as well. As regards politics: yes, Europe is a political project, as well, not a purely economic one. The treaty of Maastricht expanded the community method to other policies (environment, transport, energy etc). The Schegen area is one of the political achievments and I am not sure that the majority of European will live in a Europe cut by borders aain. And R&D is in the heart of the EU politic. Every country has its own resources, but none can deny the successes of the Nordic countries. Iceland is a good example. It seems that it starts its recovery after the Icesave sooner than expected. And yes, the euro may lead to a political union but it won’t be an obligatory one. It will be a political decision and each EU MS will have the possibility to chose whether or not going through this pathway. If the price of this will be the two-speed Europe: let it be. If a country will leave the EU/eurozone (UK?/EL?) or even don’t want to join it (NO/IS): the doors are open. No country is forced to stay in the Union. Let’s make a democratic decision about it and do what must be done. It is up to the governments and to the people via referendum to decide as they did it already in the past. Did you know or meet EU Judge Sir David Edwards when he was at the European Court of Justice for 15 years or former EU director Nicholas Argyris when he was in charge of transport, telecommunicates etc, etc.? One is an instituional colleague and the other a friend of old. Unfortunately, I do not have your contact details that’s why I cannot reply you privately. No, I didn’t have the chance to meet them in Luxembourg when I worked for CVRIA. Firstly I want to emphasise that I do not question you experiance or ability . When I say that you are young , it is a fact that young people are idealists . Years of experience leads them to realise that all is not perfect in this world , that the best laid plans may come to nothing . I assure you that I am a fee thinking person who writes , sometimes unwisely , straight from the shoulder . I am not in the least influenced by the comments of incompetents, it is purely coincidental that I use the word incompetent to refer to leaders of the EU , past and present ; neither am I influenced by Dr David Hill ; again it is coincidental the we share similar opinions . The EEC was a free trading area , not an economic community . Every country traded for themselves , with no bearing on the success or failure of other countries . Only after Maastricht did the economy become a colective resposibility . Britain joined the EEC , because it was a market on our doorstep , hitherto Britain traded with Australia , New Zealand and around the world . Foreigners love to play on Britain lost her colonies ; but that has no bearing on Britain’s joining the EEC . Australia and New Zealanf felt very let down , by Britain not continuing the volume of trade as before . I would have prefered to see an association of English speaking people , rather than our joining an European Babel . You hold up the Schengen as a great EU achievement , nonsense , it’s a disaster , allowing illegal immigrants free passage all across Europe . I traveled all over Europe before Britain joined the EEC , without the slightest difficulty , drove my car to Italy , stayed two years as a student witout registering , not the slightest bother . With Schengen you may be stopped in any member country to show your papers , which is more annoying that showing your passport one time at a frontier . Not every country is so blessed with resources , Greece being one of them . When you point out the success of Nordic countries , why is Iceland so outstanding ; not a member of the EU and defaulted on their debts , like I hope Greece will do , Italy , Spain , Portugal and Ireland , maybe even France . When Greece defaults on the Euro , or decides to not adhere to the austerity measures prescribed by the EU , you will see how easy it is to leave the Euro or EU . My guess is that if the new socialist party wins the election and decides to scrap a lot of the bail out conditions , Greece will not be thrown out of the Euro . A Greek exit would harm the EU far more than Greece’s failure to comply with the rules . The EU will oppose any country having an In or Out referendum . I do not believe that a two speed EU will work ; a country that is one of the biggest contributors is not going to take a back seat , or will substantially reduce it contribution . The EU is blinkered bureaucracy gone mad , the sooner it collapses the better . Zoltán, could you tell us your opinion/views on Masonic influence within the EU, and perhaps in areas such as EU policy formation & law? thank you very much for your clarification: I respect your openly shared views as I do with the public opinion of ‘David Hill’ and of ‘incompetents’ regardless whoever is behind that nickname. As a matter of fact, the European Free Trade Association (EFTA) was a free economic zone. The EEA (European Economic Area) ieans nothing more than expanding of the scope of the EU law to the EFTA member states regulated by international law (the so-called EEC international treaty). I am sorry but I do not regret the independence of former colonies. And joining the EEC was the sovereign decision of the UK. I can only repeat my earlier point: if the UK ever decided to leave the EU the doors would be open. But anyway, if I got your point correctly you’re saying that the EU and the economic community became a political goal only after Maastricht and I can agree to that point. And let’s make another point clear in my argumentation: the European Integration is a long running project with a sophisticated history. But nowadayss, especially after/under the economic crisis, the Integration became a necessity in the light of the global competition. Even the strong and most competitive Germany with it’s 82 M habitants cannot match alone neither of the 3 biggest economy of the world USA (300 million habitants) China (1,2 billion) and Japan (127 million). Not to mention the emerging powers (other BRIC countries). Europe is declining and only jointly can it keep its global influence in the World. (May I underline: it is not obligatory. Europe can stay divided with the greatest pleasure of the other powers. But in this case, it can forget the dreams about global influence). English is the most important language in the EU. And French and German has very strong influence, as well. In my opinion, with these 3 working languages, we can overcome the European Babel situation. As regards Schengen, may I say the example of Luxembourg. The city’s population is around 80.000 but due to the commuters, 100-200.000 peaple go there and back every day to work. A large part of them comes from another country: from FR (Metz), BE (Arlon) and DE (Trier). For that city, the free circulation of people are essential. Or may I refer to Hungary. Due to historical circumstances Hungarian minorities live unfortunarely in 7(!) countries around the state (SI,HR,SRB,RO,UA,SK,AT) and a huge part of the Hungarian minorities live close to the border but on the other side. For them, Schengen means the crucial connection to preserve their identity. Yes, I admit, that Schengen helps the illegal movements, but this is the price for the advantages and the EU is provided with the necessary policy tools to fight this phenomenon effectively (Europol, Stockholm Program, the former 3. pillar policies). Let’s follow the debate about Greece and about the Grexit after the sunday elections. thank you very much for your very interesting question. To be honest – as I indicated on my LinkedIn profile – I recently read the Foucoult’s Pendulum from Umbeto Eco and I learned that the Freemason community is the direct inheritor of the Templar order. But to be serious and honest: I couldn’t hear anything in my area about Masonic influence. But this fact doesn’t mean anything since the essence and the base of the Freemason order was always the SECRECY. Therefore, if there is such an influence, I shouldn’t know about it since it is a secret. But if this association desired to have real and visible impact on the EU decision making process, they have to do what other NGOs do: open an office in Brussel, hiring staff, accepting the ethical principles of lobbying and influence the key decision makers (Council, Commission, EP). The EEC was sold to the British people as a free trade area ; the fact that it was intended to develope into a political union , remained a deliberately closely guarded secret . Had British people known what the EEC was intended to become , voters in the 1975 referendum would very likely have voted to leave . I believe that the majotity of British people would like to leave the EU , my guess is about 65% or more . In british general elections people are not simply voting for the EU . At the last European elections UKIP were the second larest party elected . British government are at pains not to gibe British people the opportunity to vote on that or any EU matter , because the vote will be negative on a large scale . British people are not just indifferent or negative to the EU , the hate it with a vengence . I believe people at Brussels have no idea of the Antipathy to the EU right across Europe . I don’t know why foreigners emphasise the independence of former British Colonies , other than to try to put Britain in her place as a has been empire . British people have no regrets or even give it a thought . Britain , France , Germany and Italy , remain world powers , whereas the EU only thinks it is , but as yet is not . The Schengen is more trouble than it is worth , simply simbolic of a hoped for single EU state . I cannot see why countries for whom open borders is a matter of convenience , such as Luxemburg or Hungary cannot organise it on a local scale between neighbours . This is a publicly-available leaked report of the 1955 Bilderberger group meeting. If we look at the document, under the ‘V. European Unity’ section, we learn: ‘A European speaker expressed concern about the need to achieve a common currency, and indicated that in his view this necessarily implied the creation of a central political authority.’. So, it can be seen then that in 1955, there was already discussion regarding: (1.) the need to create a common currency (Euro), and (2.) the need for a central political authority (EU). I’m sure that if we read the whole document, there will be much more information regarding these items to be found. Have any of you seen or read this document before? What are your comments? Zoltan, thanks for your reply. If of interest, regarding Masonic influence within the EU, you can use a search engine and check big EU names, and you might be surprised at what you learn. Also, look at the layout of one or two of the central parks in Brussels using Google Maps (aerial view), and look for the usual symbols related to this subject. Hidden in plain sight. If progress including fiscal is to continue, Britain as a trouble maker must leave the European Union. The so called “Financial Services” can readily move to another truly EUROPEAN city.